Managing work force in the organizations has become much greater challenge in the times of increasing employee expectation, high stress levels, demanding tasks, and peer pressure and cut-throat competition. 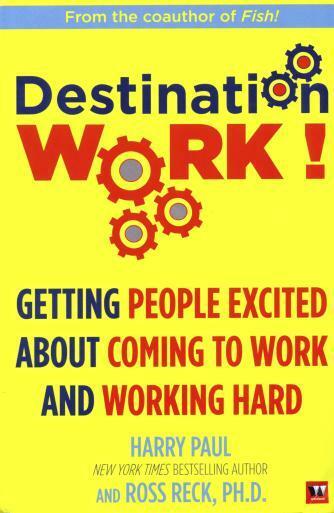 In these times Harry Paul (co-author of Fish) and Ross Reck introduce this book entitled Destination Work: getting people excited about coming to work and working hard. This book suggests ways to turnaround the organisation through motivating the workforce by displaying concern and affecting their behaviour intrinsically so that they start enjoying work. The book starts with an example of the performance of New York Giants in the National Football League losing seven out of nine matches played in 2007. The job of the coach gets questioned and thats when he changes his approach to deal with the players from ‘motivating with fear’ to ‘motivating with trust’. This reverse approach helps reap good fruits for the team and turnsaround its performance in 2008. The communication amongst the team members and the coach improves, the team members come to understand how much their coach really cares for them. This book prescribes the ways to turnaround the performance levels of employees through creating positive environment at the work-place so that employees are driven (intrinsically) to enjoy work. It is about turning around unhappy workers into happy workers. The book is all about caring for employees and to communicate this positively to them how much the organizations and bosses really care for their employees. Surprisingly we are still thinking about it after around a century when Elton Mayo with Roethlisberger had concluded in illumination study (Howthrone Experiment), that work is a group activity and taking care of employees is one of the most important motivation for them to work harder. Most fully understand that the harder employees work, the better those numbers are going to be. Happy employees - smile more, have more fun, work harder, work better with fellow employees, are more loyal and love their boss and hence the bottom line is Happy Employees are Productive Employees (p 26). Managing with trust frees employees up to turn their work into fun. As a result - the most mundane and repetitive tasks become enjoyable, employees look forward to coming to work every day - especially on Monday, and employees apply more of their discretionary effort toward performing their jobs (p 50). Fear can not be considered as a motivator rather it has to be Trust which needs to be built between the boss and subordinate through following four Be's - Be real, Be appreciative, Be interested and Be nice (p 38). Employees look forward to coming to work and working hard, lower and middle managers no long have to worry about their performance reviews, and the entire workplace is characterized by contagious excitement which translates into positive experiences for customers and shareholders. (p 106). The book is written with a fictional story of individuals (Max, Nancy, Tom, Jack) and organizations. The journey of individuals through the trivial conditions prevalent in the conservative organisational system to transform the organization towards achieving its targets is very well reflected in the book. The focus on numbers is questioned and focus on people, relationship and concern for them is explained through very many examples. The authors also provide capsules from other motivational authors at different places in the book. 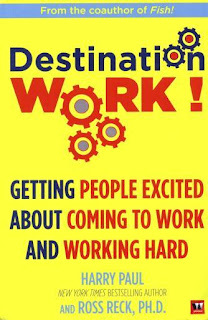 Destination work is all about creating an environment at the workplace where the employees are at ease and keep their esteem very high through their team effort. It is a book which, at its core, focuses on four Be's - Be real, Be appreciative, Be Interested, and Be Nice. Sure this small book has big message. After all we all live to work. Is it the other way?